Pure natural metal – the ultimate finish for interiors and exteriors. Art Gilding Australia provides on-site gilding services for residential and commercial architectural projects. We have worked on private homes, hotels, office complexes, restaurants, cathedrals, churches and icons. Our Master Gilder, Karl Eggert, brings more than 40 years’ experience, particularly on large-scale detailed projects. 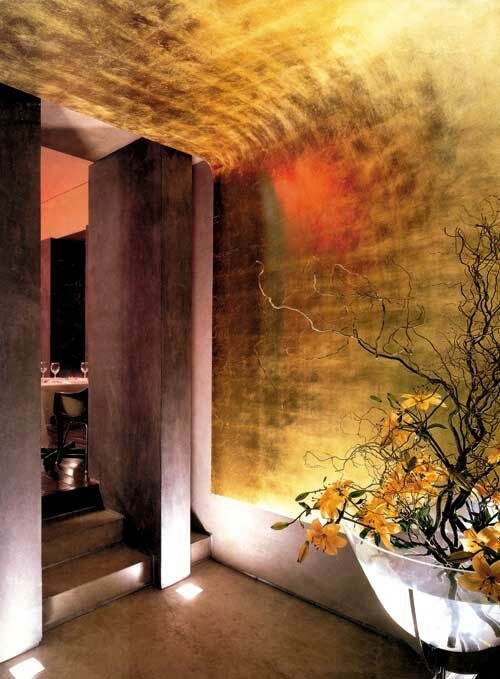 Using metal leaf gilding to highlight features or create a stunning centrepiece Art Gilding has been involved in prestigious works, nationally and internationally. This exquisite finish creates a strong visual effect and is highly durable and long-lasting. From designer apartments and penthouses to mansions and multi-million dollar yachts, Art Gilding has gilded hundreds of interiors and exteriors around Australia. We do large and small projects to suit any budget. Art Gilding has gilded some of the the world’s most prestigious office buildings, hotels, bars and restaurants. The Golden Buddha, Quang Minh Temple, Braybrook, Victoria. Many churches of historical significance. The long-lasting elegance and durability of Art Gilding’s craftsmanship can still be seen at many public sites. With fine quality European craftsmanship, we take great pleasure knowing that our work will be enjoyed by generations to come. Email Us or call Brigitte on 0293103007 to find out more.